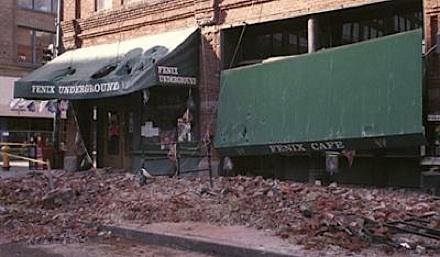 Brick facades collapsed in Seattle's Pioneer Square during the 2001 Nisqually earthquake. In contrast, the most recent major earthquake in western Washington was the Nisqually earthquake. The tenth anniversary happens to be on Monday. It was bigger in magnitude than the one in New Zealand, but ten times as deep in the ground. On the ground, the forces you would have felt in New Zealand were three to four times as strong as the worst shaking from the Nisqually quake, based on preliminary data, Vidale said via e-mail. The University of Washington's Vince Stricherz has written a nice look-back at the Nisqually quake and a few lessons that have been learned since then. For example, we have better maps of which neighborhoods have the highest risks, and more older buildings have been strengthened. "I think [the damage] would probably be worse here than New Zealand, in that we are much more built up, and we have a lot of old structures built before we knew we have big earthquakes here," says Vidale.